On 5th of March a group of 30 students from MIM and IMBA went to visit the Airbus plant in Getafe close to Madrid. The group was escorted by two professors of IE, Angel Diaz and Sharada Vindran from the Operations department. Airbus is leading company in the aeronautic sector and produces the aircrafts A320, A330, A350 XWB, A340 and the gigantic A380. 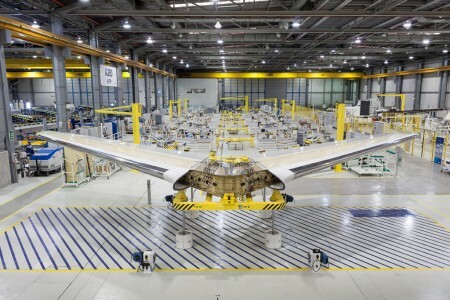 Aircrafts are complex products, integrating hundreds of thousands of components. The visit started at 3pm with a general introduction of the company and the complexity of its supply chain. In fact Airbus has many plants across Europe were the components are manufactured and just two final assembly lines (FAL) were the aircrafts are assembled (Toulose and Hamburg). After the introduction the group was escorted by the responsible of the visit, Mr. Angel Gomez to the first facility for the military aircraft conversion. In fact the Getafe Facility is deputed to reconvert civil aircrafts – used for air transport passengers – into military use such as tanker. Tankers are airplanes that can refuel other aircrafts on flight without any stop on the ground. That day there was an A330 (civil setting) under the process of conversion. The group had the opportunity to meet the blue collars and addressing several questions especially regarding the time needed to convert completely the aircraft and all the supply chain of the components. After leaving the military part of the Getafe plant the group visited the facilities where the horizontal tail planes (HTP) for the A380, A350XWB and A320 are assembled. The Getafe plant represents in the aeronautic panorama an excellence since the use of composite material to produce components – such as the HTP- is a common practice. A supplier in Illescas produces the components made from composite materials. Considering the difficulty of the composite material production and its huge quantity needed, a lean approach is used by Airbus which as to assemble all the components in a HTP and the supplier which has to guarantee high quality of the product. The visit lasted two hours and a half and the students were really impressed by the complexity of the supply chain considering all the factors in play. The visit, thankfully with the collaboration of the IE professors, represented a real application of what the IE students – during the Operations and Supply chain courses- are used to studying.